Have you been learning braille and are looking for a real reason to use it? Perhaps you are not up to the level of reading a book or magazine quite yet. Why not practice your braille and have some fun at the same time! Join us on the last Friday of the month for Braille Game Day! 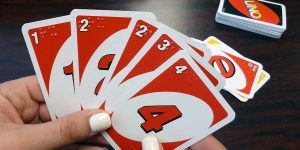 We’ll be playing card games like Uno and Fish plus Scrabble and other games with braille notation. We’ll be playing games at a relaxed pace with patience and time for beginners. We will work toward the goal of playing games with sighted friends and family. Braille Game Day participants must be able to identify the letters of the alphabet. To learn more about our individual braille instruction and to participate in Braille Game Day, please call our front desk or email email Polly Abbott.